Remember when I said I was working on a new book that required vellum? Well, I’m finally getting back to this book. 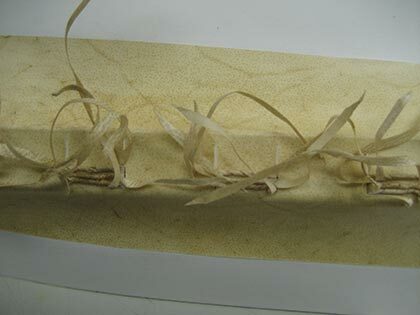 For this I’m using a tacket binding method which requires that the vellum strips, which have been soaking in wheatpaste, go through the holes in each of the signatures. Not an easy feat I must say. Here’s a picture of the work in progress. I love that the strips have this wild look to them. It took me about two hours to work through three signatures so I still have quite a bit of work left on this book. And, as I’m getting closer to adding the last signatures (I have about three left) it becomes harder to add them to the spine. Things get a bit tight there. Once the spine is done, then I’ll add the covers. This is a big book too. I normally prefer to work on smaller size books but this one I hope will become a scrapbook, so I needed lots of room for pictures, journaling and ephemera. In other bookbinding news, I am also working on some coptic journals which I hope to add to the shop in the next couple of weeks. Coptic journals are becoming my favorites. The binding is pretty and they are sturdy. Here’s a picture of one of the ones I finished, which actually won’t be making it to the shop as it has a big boo-boo. A good learning process and hey, I was able to salvage the book so I can use it. Sorry for such bad photos but I was in a rush. Once the projects are done I promise nicer pics. 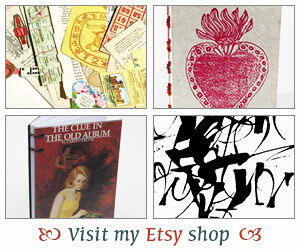 Now I’m off to relax with some good books as my back and arms are a bit tired from a long day of bookbinding. Great job Ili! I have to say I am very excited about the new designs you’ve shown me and I think I can definitely use some of them in my gift sets. Can’t wait to see you real soon. Wow, this is gorgeous. Is this one up in the shop? I would love one! Sounds great, and like it’s a lot of fun. The books look great, and I’m impressed with your talent! You are so talented! Your books are gorgeous! I look forward to seeing the coptic journals when you get them done. Lovely, what an amazing talent you have. 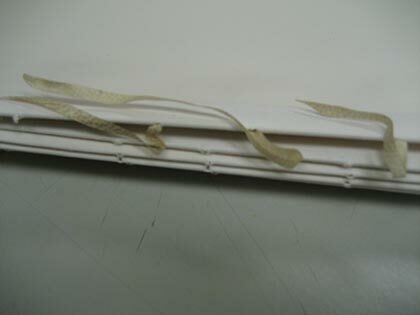 Question on the vellum book – Does the cover go over the wild strips or will you be able to see them? I like the look. Coptic book is very pretty also. Thanks so much for the comments you guys! Serena – No, this one isn’t in the shop. I’d love to be able to add this but it’s quite time intensive and the materials are pretty costly too. I’ll have to think about it a bit more before I add it. Gorgeous! And, the photos are great! I love your bookmaking posts. I’m wondering, how many pages are usually in a signature? Is there a standard amount or does it vary? You do such loooovely work! How cool to work with vellum! And the other book is gorgeous! 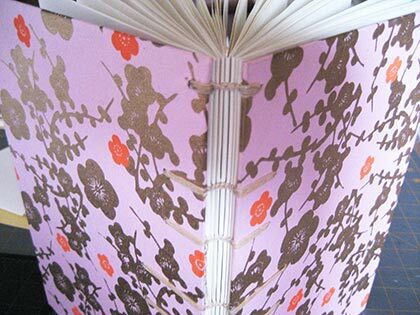 I really wish I could find somewhere local to learn bookbinding! Danielle – Vellum is really neat. A lot different though from what I expected. Maybe you should look for a weekend workshop somewhere fun and treat yourself to that one year. I am seriously thinking of doing that — I’d love to try to do that next year but we’ll see.